In her 20s, Amanda Means worked a for two years as an elementary school art teacher. One student still stands out in her memory. "This boy came in, took out a big piece of paper, paint brushes, and paints, and painted a great big TV set with knobs and a complicated scene. Then he picked it up, tacked it to to the wall, pulled up a chair, and turned it on," Means says with wonder. "It was a real thing for him. It wasn't a picture." As a young artist, Means envied this freedom and directness. "I thought, 'If I could just have something like that in my art, I'd be happy. Something so immediate. Something that is about what it is, not about something else.'" Throughout her photography career, Means has courted this child-like directness, both in subject matter and method. She began taking pictures in high school. Using her mother's camera, she photographed nature scenes on the family farm near Lake Ontario. Means went on to learn traditional darkroom processing, beginning a lifelong love affair. "I feel so connected to traditional black and white photo materials. A lot of it has to do with light and the importance of sunlight on this planet. What a force that is," Means says. "Photo paper has a certain thickness of light-sensitive silver salts. I imagine light hitting them and changing them. I've internalized all of those processes." Later, as a homesick artist living in New York and longing for the countryside, Means began making images of foraged leaves. Bypassing the camera, she used the leaves as negatives, placing them directly in the enlarger and shining a light through them to produce an image on photosensitive paper, called a photogram. Each photogram is singular, a marriage of variables. "There are endless combinations using different contrast, different surfaces, different emulsions, different amounts of time, or multiple exposures," Means says. "It's a visceral thing with me—I know how the paper reacts, and I feel very connected to it." From leaves, Means went on to photograph 3-D objects, like light bulbs, using the same process. "A really dramatic thing happens when you take this print that's been exposed—you know there's an image in there, but you can't see it—and you put it in a big tray. It's like watching a creature in water come up to the surface. It's very magical." Many of us have glimpsed the magic of this revelation while staring eagerly at a developing Polaroid. 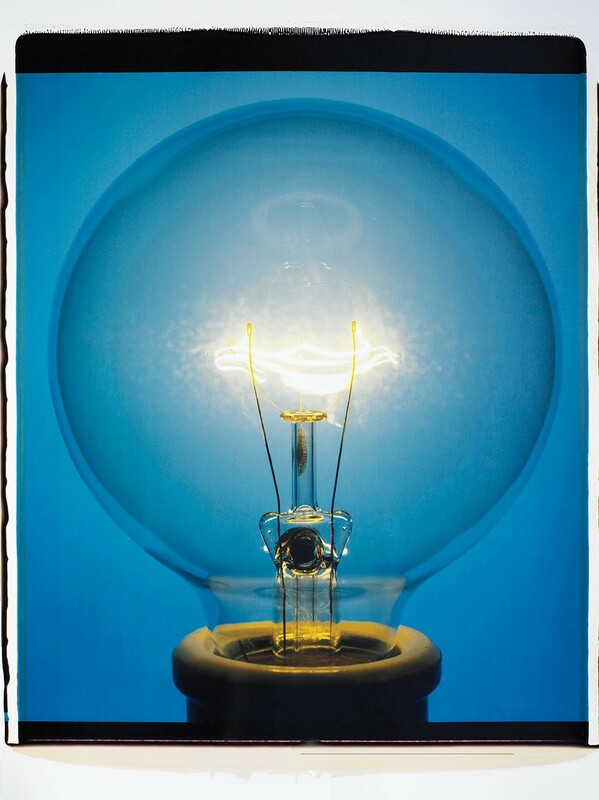 The cover image, Light Bulb 008BYo, is in fact itself a large-scale Polaroid, which Means shot using a rare, 20-by-24-inch camera at a studio in New York. Only five of these 200-pound giants were ever made, commissioned by Polaroid's founder in the 1970s. Due to obvious impracticalities, the cameras never took off commercially, though they were a favorite of artists like William Wegman. "On the Cover: Amanda Means"